Today, mascara is known as a beauty product, but the history of mascara proves mascara originated to ward off evil spirits and ill-wishers. Ancient Egyptians play a large part of the rich history of mascara. Dating as far as 3400-30 B.C., Egyptians used bone and ivory as mascara applicators, and blended kohl with crocodile dung, water and honey to create the first mascara. Egyptians lined their eyes with kohl and used the mascara to deepen their lashes. Because eyes were believed to be the windows of the soul, they concealed them to ward off any evil spirits and bad energy. Egyptian men wore mascara, as did Egyptian women. Ancient drawings of Cleopatra suggest that mascara and body painting were widely used for both protection, celebration, war and death practices. Although the Egyptians were the first known era that used mascara, it wasn't until the Victorian era in the 1830's that the practice of deepening and richening lashes was revived. Victorian women were very formal and elaborate, spending hours to dress and beautify themselves. Victorian ladies experimented with many different cosmetic recipes; rose salves, mascaras and eyeliners were all products that they created and mixed in the comforts of their own dressing rooms. Known to spend their whole day partaking in beauty rituals, Victorian women were quite the beauty divas and were known to be very vain. Mixing ashes with elderberry over a hot fire, Victorian ladies created their own mascara concoctions, but the products were never marketed, and thus, never sold. In 1872, petroleum jelly was patented and the most prominent ingredient in mascara was born. It took many years until petroleum jelly was mixed to create mascara, but finally the invention was made. In 1917, Eugene Rimmel created the first packaged cosmetic mascara. Produced from a blend of petroleum and black coal dust, the history of mascara began with a cake mascara that although reformulated, is still found today. What would we do without waterproof mascara? Love it or hate it, most women turn to this type of mascara formulation on their wedding day, or for any other special event when tears are inevitable. First formulated in 1938 from a blend of 50% turpentine, waterproof mascara, although novel and unique, caused many skin allergies. Besides the harsh chemical reaction of the waterproof formula, the putrid scent was most unbearable. Twiggy's mod lashes started a cult trend when a washable, safe and waterproof tube mascara finally hit the shelves in the early 1960's. The right mascara can perform beauty miracles. If your lashes are sparse, there's a mascara on the market that can power pump those lashes into thick and voluminous strands. If your lashes are light colored or short, there's a mascara that can add depth and length and create the doll- like lashes you've dreamed of. If you haven't found the right mascara to correct or create the lashes you desire, keep testing the mascara market. With state of the art technology and fierce competition, cosmetic companies are consistently reformulating their product till that perfect mascara is bottled. When shopping for mascara, you'll have several options in both clear and colored formulas. Consider your lifestyle and beauty needs when selecting, and remember, when in doubt, wear black! Clear- Clear mascaras are a perfect option for achieving a natural look, they're also the perfect tool for separating lashes without using color or risking clumps. In addition, clear mascara works great as an eyebrow groomer; simply brush a few stokes over your eyebrows and they'll stay set and groomed all day long. Colored- Black and brown formulas are the most popular mascara colors. Black works on everyone, brown is good for less definition with the most natural effect. Colored mascaras such as blue, violet, and maroon go in and out of vogue. Although they may be perfect for a night of fun, on a daily basis most women choose a black or brown variety. 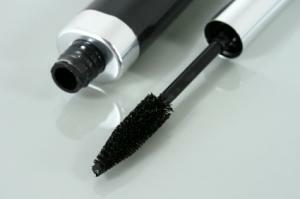 Mascara can be purchased at the drugstore or at high end department store cosmetic counters. The amount you spend on your mascara all depends on your particular lash needs and your budget. It's best to try out as many varieties as you can to find a formula that provides the definition, ease of use, and depth that you desire.